Your model 25-286, 25SX or 7386 all contain a clock battery or clock module. This page will help you find the module or battery and replace it if needed. The 25-XT does not have a clock, but it is possible to install and use a clock-calendar card. The Reply PowerBoard uses a small, often square external battery as its power source. The original part is a Dallas DS1287. While that part is no longer available new, you can get the 12887 as a replacement. A lead free/ROHS compliant version of the 12887 part is the 12887+, which seems to work perfectly well in a PS/2. Other companies like Benchmarq and Odin also manufactured these modules. While you might prefer the original Dallas part, I have found it handy to pull Dallas and other-branded modules from dead motherboards. It's also a lot cheaper and the modules usually have lots of good life left in them. If you pick another module, my experiences have shown that you may have to remove pins from modules made by companies other than Dallas/Maxim. Some of these manufacturers put pins where Dallas did not. I found a Benchmarq module that turned red hot when installed in a PS/2 Model 55SX. The cause of this problem appears to be an assumption made by IBM that no pins would ever be placed into the unused holes on the socket. As such, some of the pins are connected to +5VDC. IMPORTANT: DO NOT use the 12C887 from Dallas. While the 12887 and 1287 are not year-2000 compliant, this is not a problem in a PS/2. The 12C887 works differently in some regards and won't work in a PS/2. These modules are impressively long lived. Dallas Semiconductor's data sheet says the button cell inside this module should keep the clock running and NVRAM intact for ten years with no external power at all. Most modules last much longer than this because the computer they were originally installed in will likely have spent much of its time powered on. However, they are all going to fail sooner or later. Finding a new part can be a time consuming and expensive process. A quick look at the DS1287/12887 datasheet suggests that the modules aren't laying all their pins on the table, and that these modules are nothing more than prepacked versions of their batteryless counterparts, the DS1285 and 12885. If you're not afraid to apply a judicious amount of violence, these chips can be cracked open and re-energized. Read more here. All of these models use what is known as a CR2032 "button cell" battery. These are available almost anywhere batteries are sold. (Lots of different things use them...like keyless entry remotes for vehicles...remember that if you ever need a clock battery NOW...) They're not particularly expensive and while the lifetime seems to be nowhere near the Dallas modules, you will get at least 5 or 6 years out of one. This battery is not hard to find, but it may be difficult to get one installed if you have never done so before. I recommend use of a small object to hold the retaining clip gently up (be careful, if you push it too far out of the way, it WILL break off!) and "sliding" the battery out from underneath that clip. Installation of the new battery is even easier. With the socket empty and the battery in the correct position, simply slide it in under the tab. The Model 25 XT system does not have a built-in clock. However, someone may have installed an optional clock card into the computer. The simple fact of the matter is that many different brands of clock cards for computers have been sold over the years and all of them are different in some regard. While most use a simple button cell (from which you can get the replacement number and battery type easily) some may use less easily replaceable batteries in special packs. The best I can do to help you with a clock card in your Model 25 is to have you send me some pictures of what the card looks like. If pictures aren't possible, a description of the card and model number or maker's name are better. However, I'm not familiar with all the clock cards ever made and even with maker and model info I may be unable to help you. You can send pictures (keep the size small...don't take them or scan them in at the highest possible resolution) to me by clicking here. If you're one of the lucky few who has a Reply PowerBoard in your model 25, your battery is a small (often black in color) plastic enclosure external to the motherboard. It may be mounted in a variety of locations. This system utilizes a 4.5 volt battery. 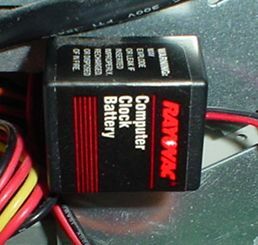 Mine came with the original, a Ray-O-Vac branded module. It's marked as being a model #840. Whether that's a universal part number or specific to Ray-O-Vac I do not know.